This week, Dale Earnhardt Jr. announced his retirement from the sport his family helped define for two generations. That's not the only thing that's changing inside NASCAR. The first time I laid eyes on the North Carolina Speedway, it was dusk in the Sandhills of N.C. Barreling south across the state that day, I didn’t know much about my new town. I knew Rockingham was home to a great high-school football program, a race track, a handful of textile mills either closed or on their way there, and my first job out of college. The sky was tinged pink as I blew by the manicured divided highways of the county’s affluent neighbor to the north, home to the world-famous Pinehurst golf club, and into Richmond County. When I crossed the county line, four lanes went to two, and the Sandhills settled into something more like sand flats, punctuated by tall pines, big trucks, and modest, low-slung homes. I’d later come to find that, like all country roads, the one leading into Richmond County was perpetually occupied by a smattering of slow-moving vehicles seemingly strategically placed to keep you from driving the speed limit or passing. But that night the road was open in front of me. As I came through a slight curve, I was shocked to see a giant, hulking structure rise up almost entirely alone, its 25-degree banked turns and stands curving stories in the air above anything within miles. Standing sentinel at the fork of two rural highways, “The Rock,” as it’s affectionately nicknamed, seats 60,000 and is surrounded mostly by empty fields. The 1.017-mile race track was one of the smaller venues in NASCAR as the sport hit its heights in the 2000s, but the way the racetrack rises up out in the country seems to tell the story of the sport’s rise from the backwoods bootlegging of old to the fastest-growing sport in the world. I remember thinking there was something proud about it, majestic even, as I rolled past in my modest four-cylinder sedan, packed with all my modest belongings, to my new life as a newspaper reporter in Rockingham. At the time, I didn’t know I’d be on the track myself one day, in a much nicer car, with a legend. I came to Rockingham at a time when NASCAR, which turned 50 in 1998, was hailed as a sports juggernaut. Long the province of Southern tracks and Southern fans, the sport had captured the imaginations of new audiences. NASCAR had high-capacity venues and diehard devotees who displayed strong brand loyalties to teams and drivers who literally wore their sponsors on their sleeves. In the heady economic days of the post-9/11 recovery, a perfect storm attracted high-dollar sponsors and giant TV deals. By 2004, the sport could even lay claim to an overused political buzzword— NASCAR dads, a moniker given the electorally crucial white, middle- and working-class male voters who enjoyed the sport. Stock-car racing had made it. Earnhardt’s father, Dale Earnhardt Sr., was 7 years older than his son is now when he died in a crash on the last lap of the Daytona 500 in 2001. The elder Earnhardt was an icon. His toughness on and off the track earned him the nickname “The Intimidator,” and his boss mustache didn’t hurt either. When the driver of the No. 3 car died at Daytona, the racing world stood still. Most Southerners can probably tell you where they were when they heard. “To my father, Dale Earnhardt, I would not have been a race car driver if not for him believing in me,” Dale Jr. said in an emotional retirement announcement. The two men raced together for only one season on the NASCAR circuit before Earnhardt died. Junior made his Daytona 500 debut almost a year to the day before his father’s wreck on the same track. In a sport with many dynasties— Pettys, Allisons, Labontes, Burtons, Jarretts— the Earnhardt legacy was hotly anticipated. In his book, “Driver #8,” Junior recalled walking up to the starting line of the Daytona 500 in 2000 and seeing one of his souvenir T-shirts on a fan. “The future has arrived,” it read. The sport isn’t known for its subtlety. But no one knew on that day just how much of the future he’d embody. One year later, Dale Jr. was 26 years old, at his father’s funeral, shouldering the weight of the racing world. The very next weekend, he raced again. At Rockingham. Earnhardt displayed grace and maturity in the worst of moments almost immediately. Within days of the wreck, driver Sterling Marlin, who had made contact with Earnhardt’s car on that last lap, was getting hate mail and death threats from those who blamed him for the crash. 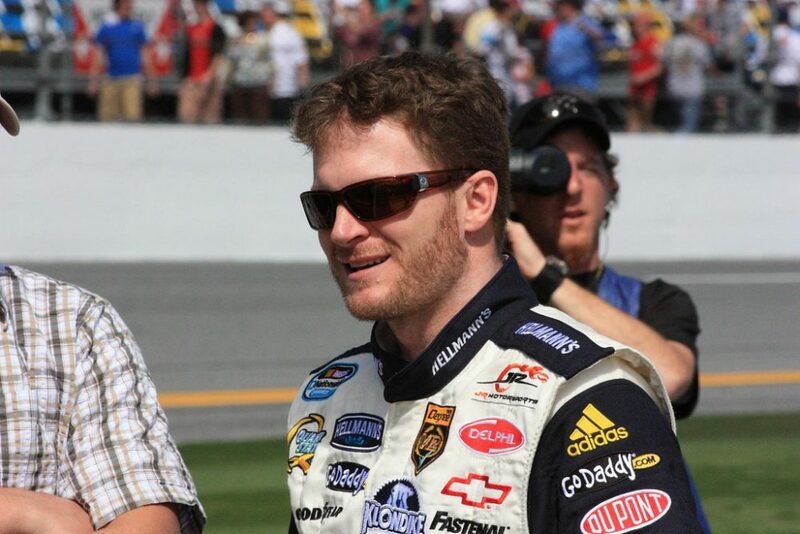 Earnhardt Jr. publicly absolved Marlin and told fans to back off. In “Driver #8,” Earnhardt said he was even worried about his friend and teammate Michael Waltrip, whose first Daytona win would always be associated with tragedy. Waltrip had crossed the finish line with Dale Jr. in second as the fateful wreck happened. Regan Smith, who drove for Earnhardt’s JR Motorsports team from 2012-2015, said it was his friend’s love of the sport and what his dad meant to it that guided him and still does. “Everybody in racing died a little bit that day,” said Chip Ganassi, Marlin’s car owner, reflecting a year after the crash. Earnhardt Jr. seemed to understand that better than anyone, and embraced the new responsibilities that came with it. There are few better ways to get to know a place fast than being a small-town, general assignment reporter. I covered the county’s largest pumpkins, the local NAACP and school board, deb balls, prize-winning pigs, murders, and middle-school science fairs. But my favorite thing to cover was local sports. The high-school football team was a perennial powerhouse, turning out the occasional NFL player and frequent state championships. If it hadn’t been for the race track, that stadium would have been biggest one in the county. Opened in 1965, “The Rock” played host to at least 70 NASCAR races over the years, and along with places like Darlington, Martinsville, Charlotte, Atlanta, Richmond, and Dover, was among the original tracks on the circuit even before NASCAR became the Winston Cup Series in 1971, the first year it sold its naming rights to R.J. Reynolds Tobacco Company. The air was heavy with cigarette smoke, though the sponsor hadn’t set out a complimentary basket of Camels that day like they did on race days. Two times a year, the eyes of the world seemed to be on Richmond County. That was when NASCAR came to town. Each reporter got to ride two laps with Junior in a stock car specially outfitted with a passenger seat. We all donned fire suits. Mine was too big for me, and I remember thinking it looked strange because it was blank instead of packed with sponsor patches. Junior had done quite a few laps before I got in the car, which means his tires were a mess already. Rockingham is infamous for its rough racing surface, thanks to the indigenous sand winding up in the pavement. Drivers didn’t hide their feelings about it. On race weekends, piles of racing slicks lined the infield, awaiting their ritual sacrifice and chucked after their laps, burnt and fragrant offerings to the Goodyear gods. Dale Jr. remembered his dad telling him, “If you ran your hand across that track, it would cut your hand. Look at all the seashells and crap in there.” On race weekends, piles of racing slicks lined the infield, awaiting their ritual sacrifice and chucked after their laps, burnt and fragrant offerings to the Goodyear gods. I jumped in, through the window obviously, got buckled in, and strained against the five-point harness to give Junior an awkward half shrug and thumbs up. His crew guy checked the harness and yelled over the roar of the idling engine, “All right, Dale, no parking with her on the back stretch!” He then hit the top of the car twice to give us the go-ahead, I looked over, and saw Dale Jr. shake his head and smile sheepishly. We pulled out of pit road, and the thing I remember most about riding in a stock car is a sensation I never felt before or since— my eyeballs shaking inside my head. We didn’t hit top speed, but well over 100 on a short track is a hell of a ride. There were times when it felt like we came so close to the outside wall, I could have put my hand through the window netting and brushed it with my fingertips. There was no parking on the back stretch. After NASCAR’s 50th anniversary in 1998, the year Dale Sr. won his only Daytona 500, a tug-of-war started inside the sport. The growing organization, governed by an ambitious second and third generation of the France Family—NASCAR founder Big Bill France built Daytona in the ’50s—was looking to grab new audiences in bigger venues, in new places, with higher ticket prices. Places like N. Wilkesboro and Orange County had already been removed from the schedule as the geographical center of the racing world moved away from its old home in the Carolinas. Vegas and California started vying for formerly sacrosanct race dates at historic tracks like Rockingham and Darlington. Short tracks with fewer seats in “saturated” small and rural markets were attracting fewer fans than NASCAR could get in more populous areas served by fewer races. “The schedule starts building out, and you start building all these tracks, and people start fighting over dates,” said Andy Cagle, a longtime fan and NASCAR columnist who’s also worked in racing and raceway promotions. Growing NASCAR was always a balancing act, and in reaching for new generations of more affluent audiences, the sport may have seen short-term success at the expense of cultivating some of its more reliable, natural fan base. During the boom times, there was a prevailing sense that the growth would never stop, the money would never end, and all the new adherents would love NASCAR without any risk to the old fan base. During the boom times, there was a prevailing sense that the growth would never stop, the money would never end, and all the new adherents would love NASCAR without any risk to the old fan base. If you followed politics during the same period, this story may sound familiar. NASCAR dads— those middle- and working-class, blue-collar white males who enjoy fishing and camping and are prevalent in the South and Rust Belt— are pretty important to both the political parties and the sports they love. You ignore them as you evolve at your peril. Even flying around got bigger and better. As races spread out, life on the road for 30-plus weeks a year got demanding, and teams poured money into private jets and, in the cases of the best drivers, helipads and helicopters at home. Though drivers sometimes complained about the track surface at Rockingham, what they delighted in was sleeping in their own beds when they raced there, as most of them lived nearby in Charlotte, N.C. But a boom for NASCAR was a bust for Rockingham. The ax fell before the 2004 season, when NASCAR removed one of its two races and gave it to California Speedway. The community was gutted. In this small town, NASCAR’s presence brought prestige and millions in economic benefits. You’ll still hear some grumble that the track had been set up to fail. NASCAR had given it a November race and a February race—about the only two months on the schedule that could mean bad weather in southern N.C. Though it was widely rumored to be The Rock’s last race, the February 2004 Subway 400 didn’t sell out. It’s too bad. It was one of the greatest finishes in NASCAR history, with Matt Kenseth edging out Kasey Kahne by .01 seconds to the checkered flag. I watched from the infield knowing it was probably the last time I’d see NASCAR race at The Rock. As money poured in, the sport professionalized. In “Driver #8,” Dale Jr. tells the tale of his father, who went from wrenching on a car in a tiny garage in his parent’s backyard to overseeing acres of state-of-the-art equipment at Dale Earnhardt Incorporated (DEI)— a facility Darrell Waltrip dubbed the Garage Mahal. Terry Satchell was one of the first wave of engineers who came through the sport in the mid-‘80s. A GM employee, Satchell consulted for many teams and drivers over a long career. He was with Harry Gant’s team during one of the most remarkable streaks in modern racing. Dubbed “Mr. September,” the 51-year-old driver won four Winston Cup races on four weekends, plus two Busch Series races, in that month in 1991. As the sport boomed in the 2000s, suddenly not being an engineer was an anomaly, said Pritchett, who left the sport after 10 years and got an engineering degree. “By the time I left in 2014, engineering departments were the largest department on any race team,” he said. A 2012 switch from carbureted engines to fuel-injection was probably inevitable, but increased the sense that this was now a game of computer diagnostics, not socket wrenches. A sport of working-class, rural Americans and shade-tree mechanics was becoming an international sport and the province of engineers. NASCAR was actually behind the times when it switched to fuel injection. The change simply mirrored a shift from carburetors to fuel injection and on-board computers the civilian world had made years earlier. Just as in NASCAR, that shift had put the formerly commonplace practice of tinkering on cars out of reach of all but the most talented tinkerers. I’ve seen it in my own life in modest ways. In high school and college, I regularly changed my own oil because it was simple and gave me a sense of satisfaction. When I bought a slightly newer car out of college, it became harder and I did it less. I finally upgraded to a new family car in 2015. I’m not sure I’ve ever looked under the hood. Younger millennials might not even know you can pop the hood on a car. Higher barriers to entry— lengthier licensing processes and expensive cars—combined with technological alternatives like Uber and Lyft have younger generations spurning car ownership and even licenses. A 2016 study showed 76 percent of Americans 20-24 had licenses as compared to 83 percent of the same group in 2008 and 91 percent in 1983. It’s fairly cliche at this point to bemoan the loss of shop class as part of American education, but as white-collar work is prized and skilled, and manual trades neglected, we are both more dependent on our devices and more distant from them, cars included. Technology exacerbates the trend. In “Shopclass As Soulcraft,” author and motorcycle repairman Matthew Crawford lays out the shift. A decline in tool use would seem to betoken a shift in our relationship to our own stuff: more passive and more dependent. And indeed, there are fewer occasions for the kind of spiritedness that is called forth when we take things in hand for ourselves, whether to fix them or to make them. What ordinary people once made, they buy; and what they once fixed for themselves, they replace entirely or hire an expert to repair, whose expert fix often involves replacing an entire system because some minute component has failed. Mike Rowe has made a life’s work out of examining America’s loss of respect for the manual trades. Where I grew up, much of that respect was cultivated in garages and driveways where people no longer work on their cars. This trend is more dangerous to NASCAR than other businesses, as a connection to cars is central to its enjoyment. Just as NASCAR’s boom mirrored the economy, so did its downturn. “A lot of it has to do with a lot of people came, they saw it, they did it, and checked it off their list,” Cagle says of the fans added during the boom years. Continuity and connection to history had been the name of the game for so long—the aforementioned Pettys, Allisons, Labontes, and Earnhardts running carbureted engines for 40 years—but the 2000s brought a lot of change fast. The Winston Cup became the Nextel Cup became the Sprint Cup. New drivers got younger and older drivers retired or lost their rides earlier. The points system became the chase for the Cup, and other rules changes followed. Even the once-reliable paint jobs— the black Goodwrench No. 3 car, the blue and red No. 43 STP—began to change week to week with the flagrancy of an Oregon athletic program. NASCAR already has more than its fair share of stats, alliances, and strategies to learn—drivers, teams, sponsors, numbers, drafting, restrictor plates, points systems, tire changes, pit stops— without throwing new stuff at fans all the time. After the 2008 economic crash, NASCAR viewership and attendance declined steadily. That’s not to say the sport doesn’t make money. Lucrative long-term TV deals and the most ingrained commitment to corporate partnerships in sports mean it remains a good business to be in. But as corporate fortunes fell, sponsors bought fewer seats, and those same TV deals have caused awkward moments as recently as April’s race at Bristol Motor Speedway. Despite exciting, short-track racing, media buzz was all about the empty stands. Bristol once held a 55-race sellout streak, but no more. The problem got so bad, NASCAR facilities are tearing out backstretch grandstands. Dover removed 27,000, Richmond removed some 50,000 over five years, Talladega at least 30,000. These losses are in the heart of NASCAR country of old. The fact that Talladega’s removed seating was the Allison grandstand sounds its own elegiacal note for the sport as it once was. NASCAR argues this is reflective of a shift in the way fans watch races, saying the the sport is especially suitable to online social media, where younger fans are likely to flock. The sport hopes that even as it becomes less of an in-person spectator sport its social media numbers will rise, as they did last year by 15 percent as drivers adopted Snapchat and put their Twitter handles on their cars. Some of that will happen, but a shift away from in-person fans also means fundamental changes in the way races run. Like many businesses, NASCAR is trying to navigate new generations and their new demands. “The fans that got you there and got the sport to where it is, you don’t want to alienate them but at the same time, the younger fan is looking for something completely different than that original fan was looking for,” Smith said. A new partnership that made the Sprint Cup the Monster Energy Cup may offer new opportunities with young spectators. The brand is edgier, the product skews younger, and Monster has been in the motocross world for years, so there’s hope some fans will cross over, observers say. NASCAR remains one of the most accessible professional sports, though not as footloose as it once was, with fans able to roam infield areas and near garages and drivers with minimal credentialing, which could attract newcomers. NASCAR remains one of the most accessible professional sports, though not as footloose as it once was. A rash of young drivers, some drawn from NASCAR’s Drive for Diversity program, reflect a different generation. Joey Logano, 26, Daniel Suarez, 25, Bubba Wallace, 23, Kyle Larson, 24, and Ryan Blaney, 23. For a long time, the sport bridged that gap with a driver like Earnhardt Jr. Though an interest in cars is central to NASCAR, personalties are paramount. Chase Elliott is the heir apparent. The 21-year-old driver has been a star through his quick rise in the sport. He’s the son of the 1988 Winston Cup Champion Bill Elliott. The perennial most popular driver in NASCAR before Dale Jr., “Awesome Bill from Dawsonville” raised his son in that same, small North Georgia town. Elliott’s success on the track has brought back some pride and a local tradition to Dawsonville. When his father raced, a siren atop the local watering hole, the Pool Room, rang out every time “Awesome Bill” won a race. Donated by a local fire station, the ear-splitting siren signaled celebration all over town. It had gone silent for years as the racing world, and the rest of the world, seemed to move on from towns like Dawsonville. When Chase Elliott started winning races, the siren rang out again. That’s the kind of straddle Earnhardt Jr. perfected— hearkening to a heyday of racing while representing a shift in the sport. Other drivers have done this, too, without being legacies— Jeff Gordon’s dominance and popularity defined an era of racing— but Earnhardt’s exit feels huge in the sport’s home. In the Rockinghams of the nation, Junior’s retirement means the sport moves further from them. He’s one of only two drivers from North Carolina left on the track. Although his exit is the emotional end of an era, Smith also thinks it’s an opportunity. “I firmly believe that what’s going to happen now is, with him retiring, we’re gonna see the fanbase be forced to pick another driver and it’s actually going to open up people’s eyes to a lot other guys who are really interesting and really entertaining,” he said. There’s promise, but the process is long and the future uncertain. I visited an old friend in Rockingham recently. Although it has felt the pains of a shifting economy and a changing sport, the county is not in despair. It has an expanding community college, a low cost of living, new parks, hiking trails, and a children’s museum new families and potential employers find attractive. It has more major retail stores than when I lived there. There’s promise, but the process is long and the future uncertain. The place is different, and it hurts a little. The days of plentiful, lifelong plant jobs with attendant benefits and pensions are gone. Disability and unemployment are high while meth and opiate problems plague families. It’s an American place, a place of patriotism and pride. But also home to many Americans who feel left behind and let down by the economy, the nation’s institutions, political and cultural leaders, and a sport born where they were. In 2016, this county made a call many such places made. Richmond County has voted Democrat in presidential elections for as long as anyone can remember— Carter, Mondale, Dukakis, Clinton, Clinton, Gore, Kerry, Obama, Obama just in my lifetime— then went for Trump. As in many places, the change was a culmination of many years of dissatisfaction with the way the American bargain seemed to have gone off the rails for them. I drove out to the race track, tall and quiet at the fork of two roads. Vacant since 2013, it was for sale for $4 million— a fraction of just one top driver’s yearly endorsement deals. A silent race track is an eerie thing, conjuring the ghosts of races past like a grainy highlight reel in my mind. There has been racing at The Rock since NASCAR left, and there may be again. But it’s different and it hurts a little. There will be plenty of drivers after Dale Jr. But the sport will be different and it will hurt a little. Sometimes when people feel they were left behind by something they love, it’s because they were. Can you blame us for gazing at that lonely back stretch and wondering how things could have been different?